Rafael Lozano-Hemmer, Standards and Double Standards, 2004. Photo by Peter Hauck. Courtesy of the artist. Lozano-Hemmer's latest project is a progression of his interest in using new approaches to create "relational" art. Abandoning his public, large-scale images and light projections for the intimacy of a gallery, the artist seeks to embody in a novel way the omnipresent scrutiny of the surveillance camera. He has chosen the belt as the object with which to explore and impart the notions of presence, group behaviour and interiority, while of course never losing sight of the symbolic association between the belt and paternal authority. In both conceptual and aesthetic terms, Standards and Double Standards remains faithful to the economy of the artist's prior projects. Despite its technological complexity, the work is visually simple in its presentation: fifty buckled belts are suspended from the ceiling of the exhibit hall. All are identical, and they fall to approximately waist height. According to Lozano-Hemmer, they represent the "absent crowd". Visitors can not only walk around the entire work, but can also literally delve into the collection through a corridor. When the gallery is empty, the belts swing slowly back and forth, each powered by a motor. Movements are determined by a series of equations known as cellular automata, discrete dynamical systems whose behaviour is completely specified in terms of a local relation. (1) To fully appreciate Lozano-Hemmer's project, it is important to understand that these systems mutually influence one another through a contagion process. For example, one belt may be programmed to automatically turn in a clockwise direction if two neighbouring belts are turning counter-clockwise. 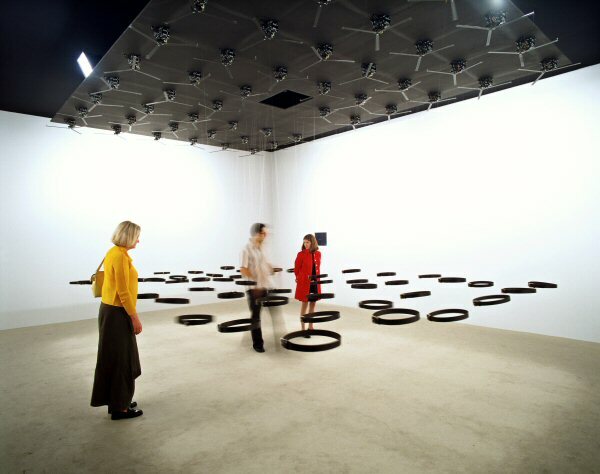 When a single person enters the gallery (cameras mounted in each of the room's four corners detect anyone entering), the closest belts will turn their buckles to face the individual. A few seconds later, the belts slightly further away begin to turn in the visitor's direction. And so the movement continues, triggering a wave-like chain reaction and creating a force field. 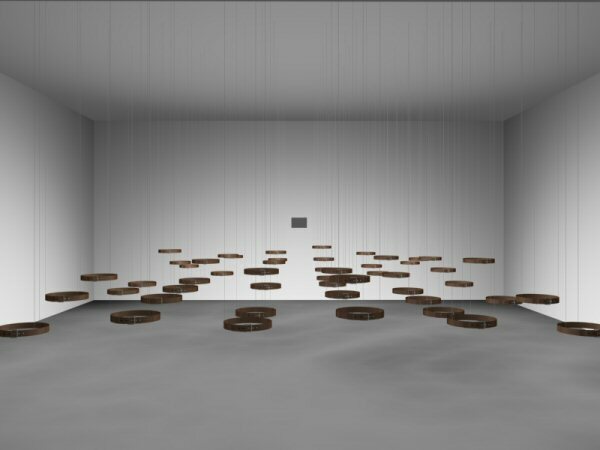 When many people are in the gallery, numerous force fields are generated and much like weather disturbances provoke unpredictable movement among the belts. This work has allowed the artist to create complex dynamics by converting a control system (camera surveillance) into a system without control (an absence of programmed behaviours) as the number of people in the gallery increases. Standards and Double Standards is therefore a reflection on surveillance and its impact on group dynamics. As with most of the artist's projects, a computer-driven screen, mounted on one of the gallery's walls, presents the data produced by the work and displays the various camera angles. The result is a demystification of the technology of surveillance. This new work was premiered at Art Basel in June 2004 and was also presented during the 5th edition of the Shanghai Biennale, from September to November 2004. Well known for his large-scale, interactive installations in public spaces, he has participated in many important events since 1990.